First Navigate to the Plugins page of WordPress and click "Add New"
Once you have an account created you will end up on the PayWhirl Dashboard. This is the main screen behind PayWhirl. Right now we need to complete the integration by registering the "webhooks". This will allow you to easily track and monitor orders. Now you need to fill in the URL of your website. 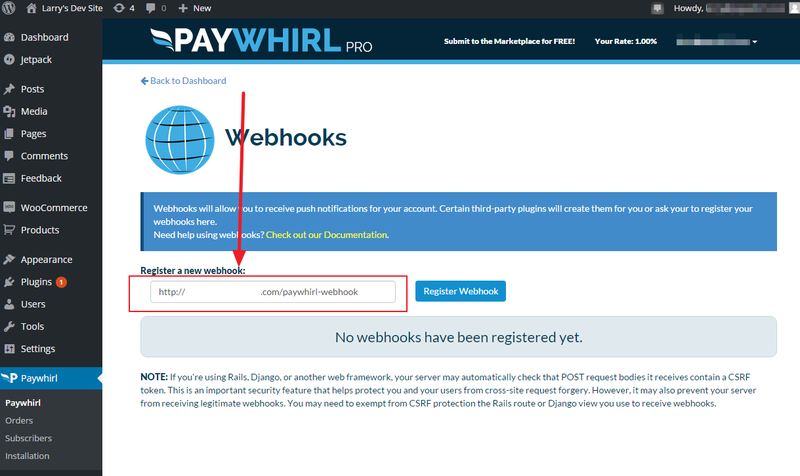 Make sure it ends with the "/paywhirl-webhook"
Now you can return to the dashboard and start making your plans and then when your ready you can embed your widget.